Well tomorrow is Good Friday already, wow time is flying this week. I hope that you have a fabulous holiday weekend with family and or friends. The weather here is fabulous, not sure if it's going to stay or not but summer is right around the corner. My weekend will be a quiet on I think, but I certainly don't mind. For my post this week , I decided to step out of the box, I mostly do card or tags etc. Never scrapbook layouts. Well I decided to do an Easter scrapbook layout. I am actually working on a album for my parents, Their 50 th wedding anniversary is this summer. So my mom and I have been going through pictures, I found a lot of great pictures. I have to go visit and get more pictures, I'm really looking forward. Going to visit, talk about pictures and visiting with my parents was wonderful. 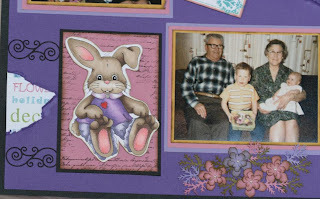 Here is my page, it was my first Easter I was only 3 months old. That was a long time ago. 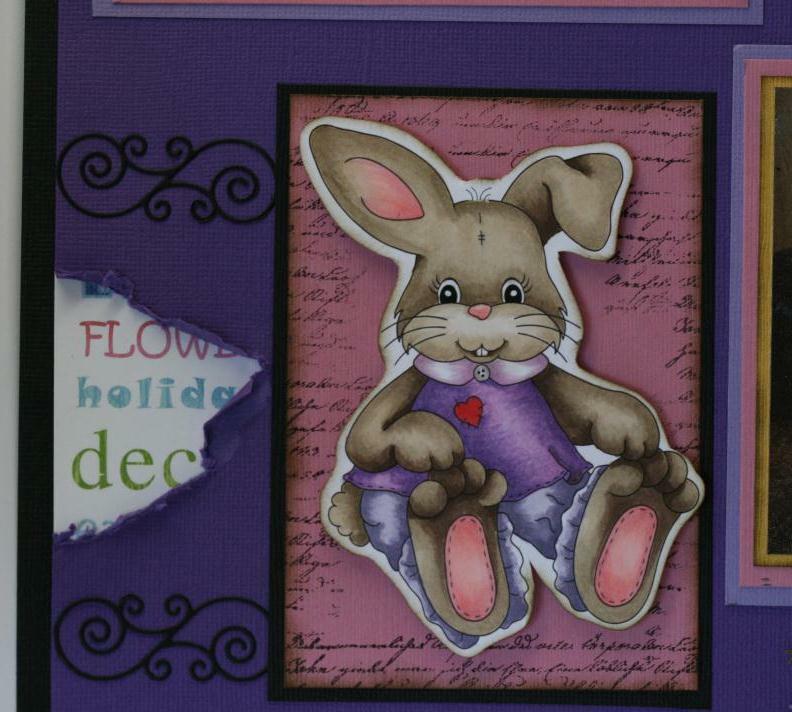 I colored and used the image Happy Little Bunny from Whimsy Stamps by Stamp Art Design. I loved this image and it fit really well with layout and was fun to color. I hope that this will inspire you to create today if not have a wonderful day any ways and Happy Easter. The bottom part of my page with my brother and grandparents. 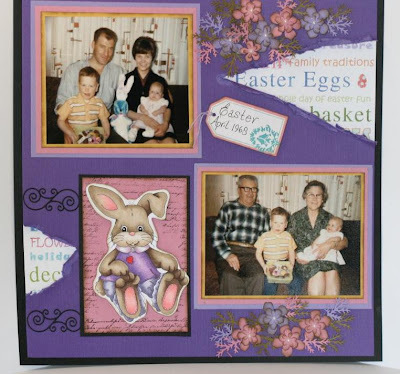 Supplies: Bazzill cardstock, Happy Little bunny from Whimsy Stamps, Memory box dies: flowers and swirls, martha Sterwat branch punch, Zva pearls. Wonderful layout, cute super cute bunny...nicely done friend...great job, they will love it, and you for making it...cheers! Happy Easter!